Produktinformationen "DD 24: PERIPHERIQUES architects - Happy architecture in a real world"
For 10 years, Peripheriques has been a structure in constant evolution, exploring production and the diffusion of architecture and town planning, while proposing the negotiation and sharing of ideas between several partners as a platform for creation. 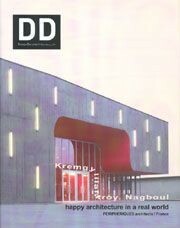 DD examines some 30 inspirational works and projects, the majority realized in France, through texts, photographs, models, plans and elevation. Weiterführende Links zu "DD 24: PERIPHERIQUES architects - Happy architecture in a real world"
Unser Kommentar zu "DD 24: PERIPHERIQUES architects - Happy architecture in a real world"
Kundenbewertungen für "DD 24: PERIPHERIQUES architects - Happy architecture in a real world"